Arizona State University has received a $1.5 million award from the W.M. Keck Foundation’s Science and Engineering Research Grant Program to study the origin of Earth’s water and hydrogen. The project, entitled "Water from the Heavens: The Origins of Earth’s Hydrogen," will be headed by Principal Investigator and Regents’ Professor Peter Buseck, of the School of Earth and Space Exploration and the School of Molecular Sciences. “True to the Sun Devil spirit, Professor Buseck’s team proposal was ambitious in scope, innovative in approach, and ripe with transformative potential. We are delighted to see the Keck Foundation’s decided endorsement of this attempt to tackle one of the most intriguing controversies in planetary genesis,” says CLAS Natural Science Dean Ferran Garcia-Pichel. Buseck and his team will seek to answer the fundamental question of where the water on Earth originally came from. The path to understanding this leads to experiments that measure how hydrogen behaved among the metallic elements in the core and mantle of the early Earth. “The origin of Earth’s water and hydrogen is a long-debated, yet unsolved mystery,” says Buseck. While current models dismiss the theory that a significant source of hydrogen is from the early Earth’s gas cloud, the team’s theory, referred to as the “ingassing hypothesis” would require that substantial amounts of hydrogen be removed from the mantle and stored in the core. This has not been an easy theory to test, however, because of the complexity of simulating the extreme pressure and temperature deep within Earth. To overcome these challenges, Buseck and his team have developed breakthrough high-pressure techniques using transmission electron microscopes and diamond-anvil cells, both located on the ASU Tempe campus. If successful, the method would significantly advance high-pressure technology. The Experiment team is led by Buseck and Assistant Research Professor Jun Wu, with Associate Professor Sang-Heon Shim and Associate Research Professional Kurt Leinenweber. The Analysis team is led by Assistant Research Scientist Stephen Romaniello and President’s Professor Ariel Anbar, along with Regents’ Professor and Center for Stable Isotopes Director Zachary Sharp at the University of New Mexico. The Theory team is led by Professor Steven Desch and Foundation Professor Linda Elkins-Tanton. ASU is one of only six universities this year to receive a Keck Foundation award in the Science and Engineering Research Grant category. The W. M. Keck Foundation was established in 1954 by William Myron Keck, founder of The Superior Oil Company. Mr. Keck envisioned a philanthropic institution that would provide far-reaching benefits for humanity, supporting pioneering discoveries in science, engineering and medical research. 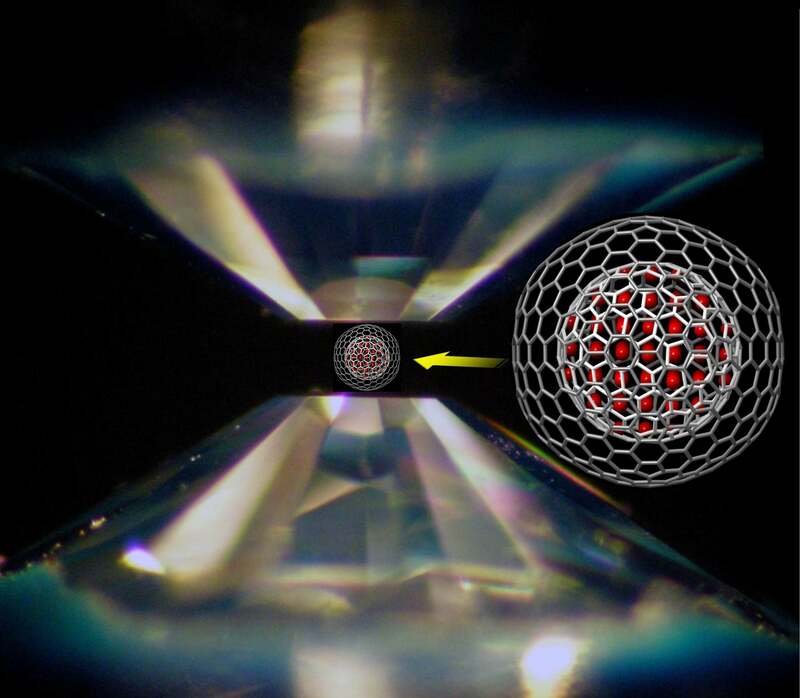 Top image: Greatly enlarged pair of diamonds used to squeeze a spherical carbon container (shown schematically with a chicken-wire appearance) that will provide high pressures to the enclosed iron metal (show in red). Photo Credit: S.-H. Shim and Jun Wu.